With incredibly silly nicknames, Leadbeater’s Cockatoos are either loved or hated by aviculturists! The trick to keeping one seems to be to raise it correctly. In the wild, Leadbeater’s Cockatoos eat grass seeds and roots. Their habitat is patchy throughout arid parts of Australia and the breeding season varies depending on the area of the continent. Leadbeater’s Cockatoos always nest in eucalyptus trees and chew out the bark inside to provide soft shavings for their nest linings. In captivity, you should feed your Leadbeater’s Cockatoo a good pellet or seed mix formulated for small parrots. Large amounts and a good variety of fruits and vegetables should be provided and supplemented with meat like chicken bones or cooked chops. 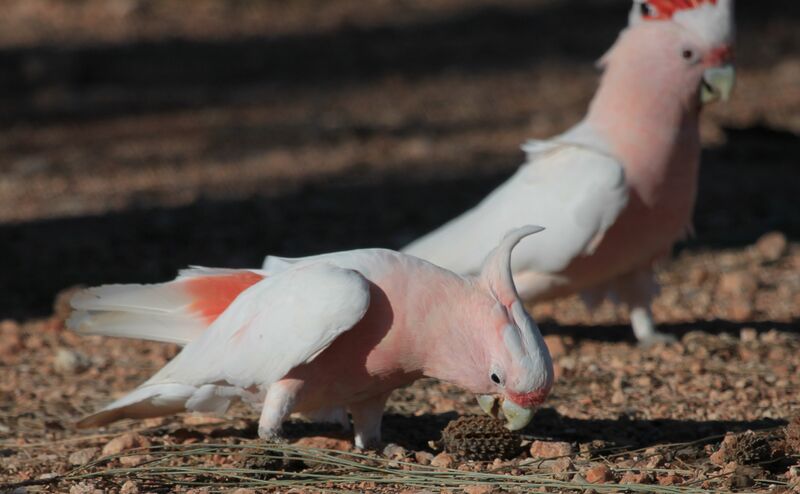 Since Leadbeater’s Cockatoos become easily bored, keep them busy with lots of branches to chew on and pine cones to shred. Leadbeater’s Cockatoos are very enthusiastic chewers, so be sure their cages are quite sturdy! They may also be quite loud, as they have a distinctive shriek. When Leadbeater’s Cockatoos are young they are incredibly affectionate, but as they grow older they will try to assert dominance over you and must be prevented with a firm hand. When raised properly, Leadbeater’s Cockatoos are quite affectionate, amusingly playful, and generally a joy to own, cuddle with and play with. At maturity, Leadbeater’s Cockatoos are about 14 inches in length and weigh from around 300 grams to around 425 grams, with females weighing slightly larger than males. Their general plumage is white and they have forward arching white crests. 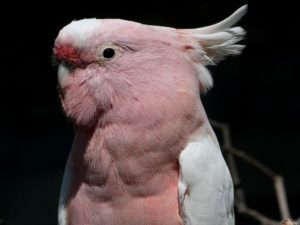 The breast and heads of Leadbeater’s Cockatoos are salmon pink and there are red bands across the crests. One subspecies has a yellow band on the crest. The iris in females is reddish brown, while males have a very dark brown or black iris. First noted by Vigors in 1831, Leadbeater’s Cockatoo is native to the desert and grassland regions of Australia’s interior, save in the northeast. 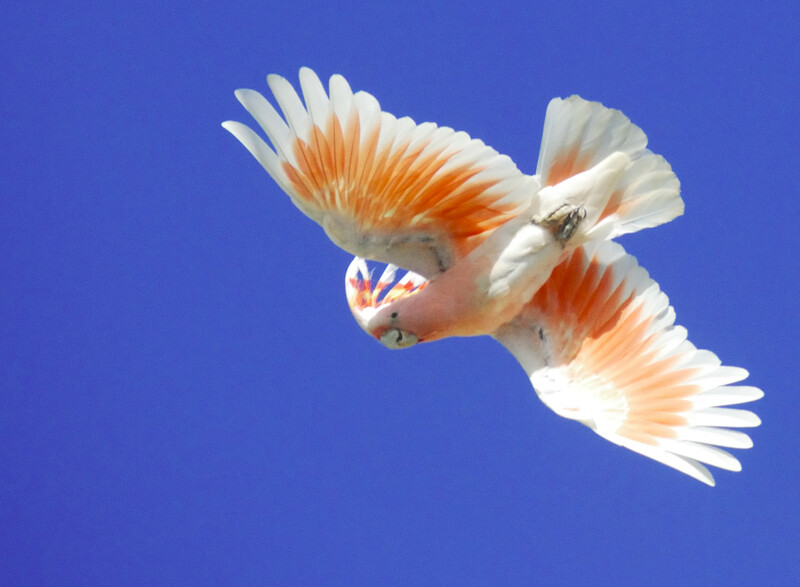 Leadbeater’s Cockatoos are known by a variety of silly names, including Desert Cockatoo, Pink Cockatoo, Major Mitchell’s Cockatoo, Wee Juggler, Cocklerina, or Chockalott! Although they are common in parts of Australia, overall Leadbeater’s Cockatoos are quite rare. In captivity, you should feed your Leadbeater’s Cockatoo a good pellet or seed mix formulated for small parrots. Large amounts and a good variety of fruits and vegetables should be provided and supplemented with meat like chicken bones or cooked chops. Leadbeater’s Cockatoos flourish in an aviary of about five meters by one and one fifth meters by two meters. It should be constructed of very sturdy metal. Provide your Leadbeater’s Cockatoo with a hollow log of about 30 centimeters in diameter and one meter in length. 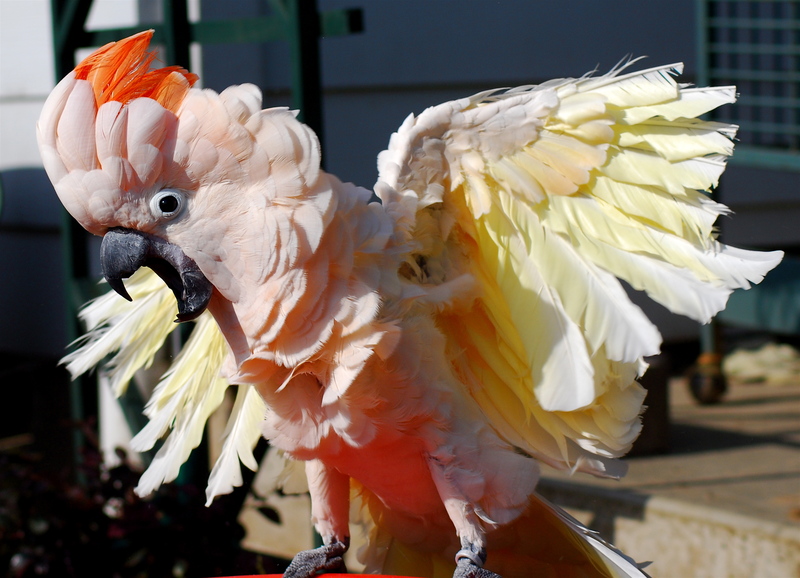 Make sure your bird has chew items at all times, because when they become bored, Leabeater’s Cockatoos have the bad habit of plucking their feathers out. It is often hard to find a mate for a Leadbeater’s Cockatoo. If you combine incompatible birds, they will fight. Leadbeater’s Cockatoos are territorial during the mating season and will attack anything that approaches inside a two-meter radius of their nests. In the wild, where nesting ranges overlap, a pair will establish dominance and prevent the other Leadbeater’s Cockatoos from breeding. The clutch usually consists of two or three eggs that will incubate for about 28 days. Usually, the male will sit on the clutch in the daytime and the hen will take over at night. At about two months of age, the young Leadbeater’s Cockatoos fledge. At six months of age, they are independent, and in captivity should be removed from the parents. They will not reach sexual maturity until they are three to four years old. Immature Leadbeater’s Cockatoos have pale brown irises, but apart from slightly duller plumage they resemble adults nearly exactly. Leadbeater’s Cockatoos have been known to breed for up to 37 years!